Magam Ruhunupura Mahinda Rajapaksa Port (MRMRP) in Hambantota today received two brand new ZPMC Ship to Shore (STS) Gantry Cranes and one Rubber Tyred Gantry (RTG) Crane from China. The cranes arrived at MRMRP on the vessel MV Zhen Hua 13. Each new STS Crane has a capacity of 50T under speader, with an outreach of 50m, backreach of 16m and a rail guage of 35m. The RTG Crane has a capacity of 41T under speader with a span of 23.47m and a lifting height of 18m. 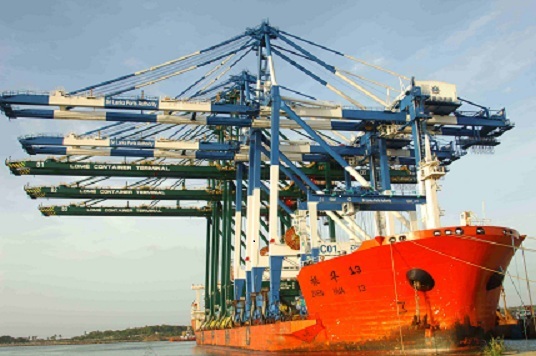 The cranes were received at the port as a part of the Magam Ruhunupura Mahinda Rajapaksa Port Development Project. These new ships to shore cranes are essential for MRMRP as they have arms which are much longer than the usual gantry cranes and could link ship to the shore. The Sri Lanka Ports Authority (SLPA) will inaugurate the new Tank Farm Complex and Bunkering Terminal on Sunday, June 22, the latest integration to the portfolio of services offered by the Magam Ruhunupura Mahinda Rajapaksa Port (MRMRP) with President Mahinda Rajapaksa as the Chief Guest.